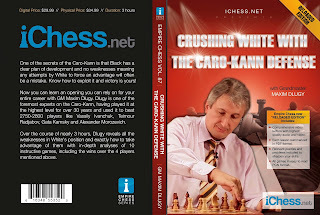 The "Crushing White with the Caro-Kann Defense" (Reloaded Edition) DVD by GM Maxim Dlugy contains a series of lectures on suggested lines to play as Black in the Caro-Kann, along with a brief (2-page) summary of the main points of the four chapters in PDF format, and 10 games in PGN format on the disc. Not all of the games/variations he presents are contained in the PGN files. Chapter 1 - the Advance Variation, featuring Morozevich-Dlugy (2015). Dlugy advocates the usual 3...Bf5 response by Black and looks at some of the more aggressive options for White featuring the g2-g4 advance, as well as the standard Nf3/Be2 development (Short System). Chapter 2 - the Main Line with 4...Nd7, including four games from various points in Dlugy's career. This is valuable for anyone who plays that line, but it is no longer very popular. I've never been interested in playing it, in part because it makes development of the light-squared bishop more difficult. Anatoly Karpov used the variation for a long stretch as his main defense, probably its greatest claim to fame. Chapter 3 - the Exchange Variation and the Panov-Botvinnik Attack. There is no actual database game given regarding the Exchange Variation, but Dlugy spends some time looking at an offbeat but effective-looking treatment of the line, using a maneuver with 6...g6 followed by ...Nf6-h5 as the main idea for Black. After that is finished, the lecture includes two database games on the Panov-Botvinnik Attack that feature the solid 5...e6 variation; the other two main approaches are 5...Nc6 and 5...g6 (a gambit). The PDF notes for this chapter are also quite helpful in outlining specific ideas, for later reference. Chapter 4 - Dlugy returns to the Main Line with 4...Nd7. This section has three more database games, including the infamous 1997 Deep Blue - Kasparov game where the computer won in 19 moves; this probably is the real reason (if not a completely valid one) for the variation's subsequent unpopularity. The centerpiece of the chapter, as a somewhat strange choice, is a blitz game Dlugy played against Radjabov. This DVD isn't comprehensive enough of an intro to the Caro-Kann to stand on its own, if that is what you are looking for. For example, it doesn't cover some of the White variations often encountered at the club level (Two Knights, King's Indian Attack, Fantasy) and the PDF lecture notes are of uneven helpfulness (Chapter 3 being the best). As basically a repertoire-based lecture on the main lines, it does offer some good ideas in the particular variations Dlugy uses. 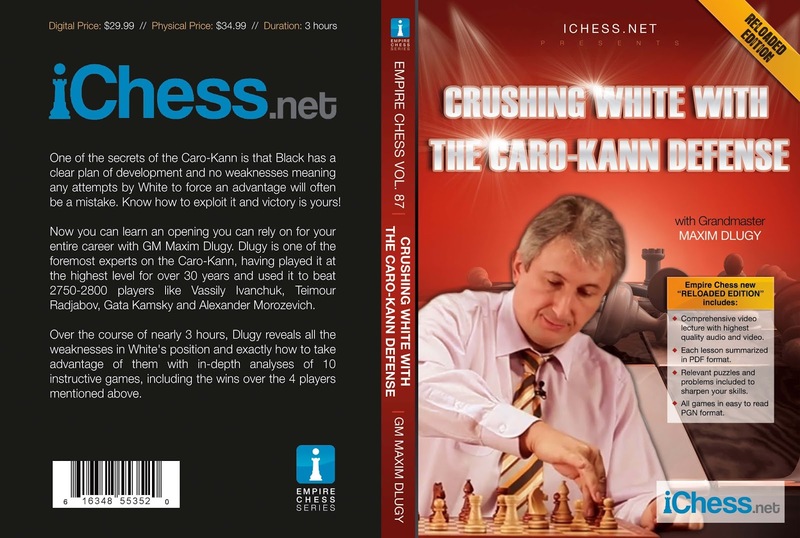 Chapter 3 was particularly valuable for me, as Dlugy offers concrete strategic, tactical and even "philosophical" insights into Black's play in the Exchange (which he calls the "Fischer" variation) and the Panov. The first part of the Panov variation presentation I found valuable, following a particularly instructive Karpov game, but the second part featuring one of Dlugy's own games was not as convincing or well-organized. I found it annoying in a video lecture aimed at the Black side to still have a board with the White pieces at the bottom. It would seem that the software used to record it would not allow for flipping the board, which is simply antiquated. While having White on the bottom is still mostly standard for diagrams in Black-oriented repertoire books (if not 100% of the time), it felt rather awkward watching the board from White's perspective for the whole video. When you're reading a book but have a separate board set up in front of you, the diagrams are less of an issue, but using a separate board is not practical to do with a video lecture. The presentation quality is uneven, with some segments flowing well and with insightful integrated commentary. Others however show Dlugy being somewhat unprepared and having to check his notes. I don't really understand why presenters don't simply do a retake when this happens, but it's a common phenomenon with chess videos across different publishers. Dlugy sometimes plays out the (relatively few) games to the bitter end in the endgame, commenting along the way. Sometimes this can be good when typical structures for an opening are presented, but other times it just seems to drag things out, for example with the last blitz game. There are 10 pages of PDF puzzles also included, with two positions per page, but which variation they are taken from is not referenced in the text.